This very masculine stainless steel watch features a round black face and chronograph and is ideal for the man who doesn't want to change his watch every time he changes his clothes. Large white luminous numerals along with sweep hand and date indicator provide all the essential timekeeping functions. This luxury watch features a solid stainless steel case, strap and buckle. 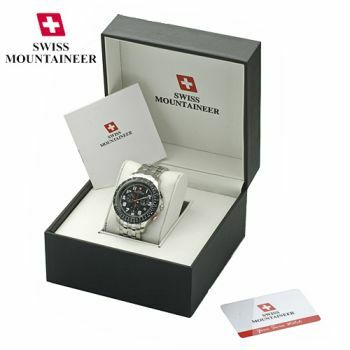 An accurate Swiss movement and a 2 year warranty make this a high quality men's watch. Combined with 100 meter water resistance this is a watch that need never come off the wrist. Elegant enough to wear to the office, and sturdy enough for the weekends.